Breathe deep, draw the air to your center, and hold. Reach beyond mere physical air. Feel the subtle breath of the spirit, the flow of vital energy, of the very essence, as it flows through the twelve channels. Focus on your abdomen, upon the reservoirs of spiritual power, and exhale the air alone. Feel that power – your Qi – build and strengthen. Feel the wings of the butterfly tremble within the chrysalis of your soul. That delicate yet unfathomable strength is at the core of the higher arts. Careful balance. Smooth and flowing kata, ever more irresistible. The subtle art of breath control. Balance and harmony. The regulation of inner energy. With these tools the martial artist may transform himself. And in Exalted, where all things are forged of magical Essence, and even mortals may direct it through skill and ritual, this is just a trifle more literal. In Exalted, Mutations can represent a lot of things. Sure, they can make you “too wyld to live in Creation” – but mutations bestowed by demesnes (and presumably by manses since they work the same way) and inheritance are specifically exempt (see Oadanel’s Codex under demesnes and the rules for created races). Evidently mutations acquired under the rules of Creation don’t count as “wyld” mutations – just as “mutations”. Mutations can represent the results of thaumaturgy, or even of mere hard training. Yes, with work and determination you can drink those lousy protein shakes, train four hours every day, put a hundred pounds of muscle on that scrawny little body, and – eventually – develop the equivalent of the “Large” mutation. Ergo, this particular art focuses on ritualistic, thaumaturgic, techniques for tapping into and channeling the energies of manses and demesnes. At least to start, it does not require an awakened essence pool. For good or ill, Gods, Exalts and other natural essence users cannot be mutated by simple exposure to the energies of Creation – and so cannot use this style, leaving it the exclusive province of mortals. 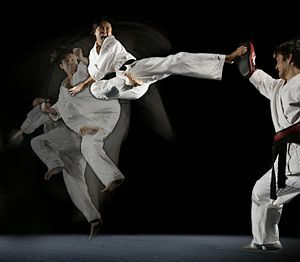 If someone who has it Exalts, they may replace this style – and the mutations it provides – with another martial art they are otherwise qualified for. 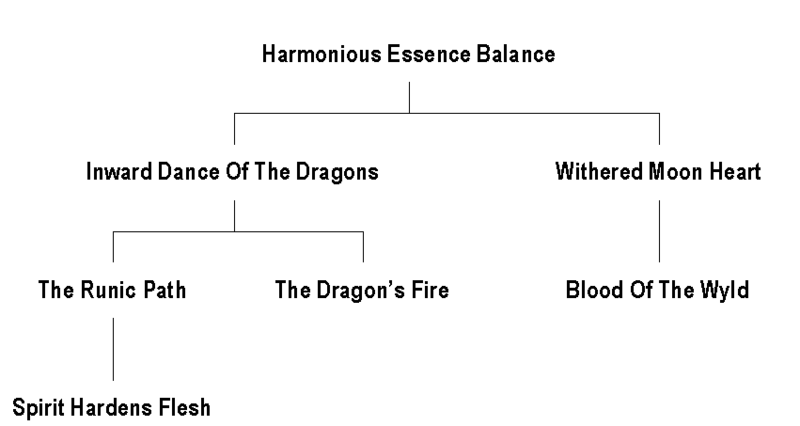 Harmonious Essence Balance: Cost: 3w; Mins: Martial Arts 2, Essence 1; Type: Simple, Keywords: Shaping, Duration: Special, Prerequisite Charms: None. Does not require awakened essence. The user may rechannel and rebalance the essence flows of the body. Given a week in which to work he or she may remove up to three points worth of personal mutations or one point worth of someone else’s mutations – although this requires the “targets” active cooperation. If the mutations were purchased with XP or bonus points, those points are refunded. Inward Dance Of The Dragons: Cost: —; Mins: Martial Arts 3, Essence 1; Type: Permanent, Keywords: None, Duration: Permanent, Prerequisite Charms: Harmonious Essence Balance, Does not require awakened essence. The user may attune to manses and demesnes and their energies to mutate himself or herself. The experience points spent on this charm, and on any later charms on this style, may also be used to purchase mutations at the usual rate of 2 XP per point of mutation – provided that the user gains access to a demesne or manse rated at at least half the point cost of the desired mutation to tap into. This is useful – but it actually isn’t that hard to get mutations if you want them. The most efficient way I can come up with is a little further down – and it’s far more efficient than this. The Runic Path: Cost: —; Mins: Martial Arts 3, Essence 2; Type: Permanent, Keywords: None, Duration: Permanent, Prerequisite Charms: Inward Dance Of The Dragons, Does not require awakened essence. The user may render up to (Willpower) points of his or her personal mutations nonphysical – and thus selectively remove any aspects of them that displease him or her. This charm may be purchased again at Essence 3 to cover an additional (Integrity) points of mutations. Spirit Hardens Flesh: Cost 3M or 1W, Mins: Martial Arts 4, Essence 3; Type: Reflexive Keywords: None, Duration: Scene, Prerequisite Charms: The Runic Path, Does not require awakened essence. The user may draw on the strength and durability of a Manse to which he or she is attuned, giving him or herself protection equivalent to a suit of attuned artifact armor (of an exact type selected when this charm is acquired) of a level equal to the (level of the manse – 1). If the manse is indestructible the rating is equal to the level of the manse. If it normally provides other protective benefits to it’s occupants, those apply to the user as long as the “armor” is sustained. Now you just need to find an Exalt with a high-powered manse who will allow a mortal to fiddle around with the place… There are easier ways to get armor than that. Withered Moon Heart: Cost: 1W OR 3M; Mins: Martial Arts 3, Essence 2; Type: Supplemental, Keywords: None, Duration: Permanent, Prerequisite Charms: Harmonious Essence Balance, Does not require awakened essence. The user may augment an unarmed attack with a burst of mutagenic energy drawn from a manse or demesne to which he or she is currently attuned – inflicting up to (Highest Demesne or Manse Rank) points of negative mutations. If the user is attuned to at least three Demesnes or Manses add +1 point worth of negative mutations. This can be really annoying – but it is sort of a long-term thing. Unfortunately, tricks like Order Affirming Blow will NOT remove such mutations; they have nothing to do with the Wyld and are not shaping effects, any more than a broken leg is. Blood Of The Wyld: Cost: 2W OR 6M OR 1W 3M, Mins: Martial Arts 3, Essence 3; Type: Simple, Keywords: None, Duration: One Scene, Prerequisite Charms: Withered Moon Heart, Does not require awakened essence. If the user can find a Freehold to draw upon, he or she may tap into it’s energies to manifest a Behemoth rated at (Freehold Rating -1) around himself or herself. He or she cannot be harmed until the Behemoth is disposed of. This charm can be purchased again at Martial Arts 5 to increase the Behemoth Rating to (Freehold Rating). The Dragons Fire: Cost: 2W OR 6M OR 1W 3M, ins: Martial Arts 3, Essence 2; Type: Simple, Keywords: None, Duration: Scene, Prerequisite Charms: Inward Dance Of The Dragons, DOES require awakened essence. The user may take on up to (rank of highest attuned manse or demesne +1) points of mutations for the scene. Unlike it’s prerequisites, this charm requires awakened essence; you simply cannot tap into such energies swiftly enough by thaumaturgic means. Mortal characters in Exalted can, in fact, start off with access to any mutations they want. Every year a non-essence user spends in a demesne – up to a number of years equal to the level of the demesne – inflicts one point worth of negative mutations and grants two points worth of positive mutations. Some positive mutations have equal-and-opposite negative mutations, which cancel out. Characters who pay for something get to pick it’s properties. A demesne-2 costs one background or bonus point. So: buy a selection of demesnes-2, make sure that their negative mutations are cancelled out by positive mutations, and you’ll wind up with a net balance of two positive mutation points per background point spent on them. So; buy a Rating-3 Manse with Hearthstone 0 (+3), Maintenance 4 (+4), Fragility 1 (+2), and Habitability 3 (+3). That provides 18 Creation Points. Spend them buying Zone of Influence (3), Password Controls (1), Bound Servant Force (to do the maintenance and provide some useful servants or services, 3), Magical Conveniences (1), and ten instances of Mutagenic (10). Now, each incidence of Mutagenic in a Rank-3 Manse can bestow three points of negative mutations and six points of positive mutations. Trading those off leaves you with thirty points of positive mutations for every mortal in the manses zone of influence, gained at a rate of ten points per year. That’s not bad for three background points. Even better, the place is pretty useless to anyone but mortals; the hearthstone is useless, you can’t get inside to boost your essence regeneration, and it’s mutagenic power (presumably) doesn’t affect essence-users. The only thing it’s good for is to provide mutation-boosts for mortals – which is exactly what any mortal owner wants. In fact, if you don’t want to bother tailoring the mutation-packages, you can skip the password controls and the magical conveniences and get thirty-six points of mutations out of your three background points. That’s terrible cheese of course, but if you’re going to be a mortal in an Exalted game, you need all the cheese you can get. You are, after all, being a humble little mouse in the great house of the Primordials and Exalted.